Safe tree removal is more than a chainsaw, a crew, and a truck. When you need a tree removed you want the peace of mind that comes with an insured, professional tree service. Can I get a free Estimate? – Yes, you can. Contact us and we will arrange a convenient time. Are You Insured? – Yes, we are fully insured. What happens to the wood and debris? – We completely remove all tree material and debris; including the stump. Can you handle overhanging or dangerous jobs? Yes. With 30 years of experience, the right equipment, and skilled staff we can handle any tree removal situation. 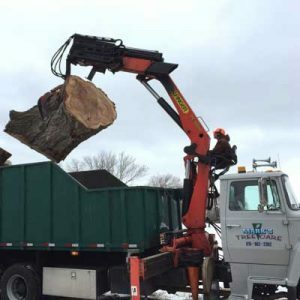 When you need a tree removed, you want a tree removal service that can work anywhere on your property and is not restricted by the limits of their equipment. Staff from Mark’s Tree Care can safely climb and take down your tree, piece by piece. This allows them to work on any tree, anywhere, on your property. Tree removal services by Mark’s Tree Care completely removes unwanted trees and leaves your property tidy and clear of all debris. 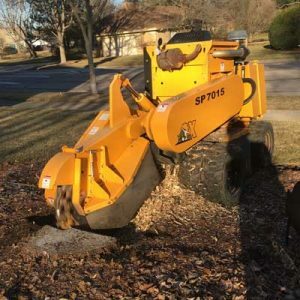 All large wood pieces are removed, branches are run through the chipper and the area is carefully raked to remove the small debris created during tree removal. We do the entire job, so you are left with a clean yard, not a messy cleanup task. A professional tree service company will offer complete removal of your tree from the top of the crown to the stump. Consumers should be cautious about cut rate tree removal quotes, often they fail to remove the stump and properly clean-up. Stump removal requires special equipment, time and extra effort. When done correctly you end up with no visible sign of the tree. Mark’s Tree Care can finish your tree removal job in several ways. You choose the option that best fits your desires and situation. Tree removal is dangerous heavy work and can be costly. Looking for a cheap solution and choosing the wrong tree service can be even costlier in terms of hassle and dollars.